You can’t predict, but you can prepare. The very definition of emergencies is they’re sudden, unexpected and urgent. When it’s involving your child, panic can set in; but there are a few steps you can take to ensure your response is measured and efficient so your child can receive treatment from an emergency physician as soon as possible. Know your child’s medical history. Even if you know it by heart, the more detail you can provide the physician, the better off you’ll be. There are health information forms you can print out online. Fill one out and keep copies in a diaper bag, car and your purse. You may also want to leave a copy when leaving your child with a babysitter or caregiver. Know the best emergency room for you and save the location in your phone. Take a look at Elite Care’s locations to find the Elite Care 24-Hour Emergency Room closest to you. Keep the address accessible somewhere in your home, such as on the refrigerator, or consider packing it with the above medical history. Keep the address saved in your phone by saving it as a Google Maps place. Take a CPR course. Would you know what to do if your child needed CPR or emergency first aid? Consider signing up for a course so you know how to properly respond to a breathing emergency for a child. Know when it’s appropriate to go to an ER vs. urgent care. Do you know where to go? Take a look at our situational checklist to determine when it’s necessary to go to an emergency room or an urgent care. By having a plan in place, you can get to an emergency room faster so your child can be treated. 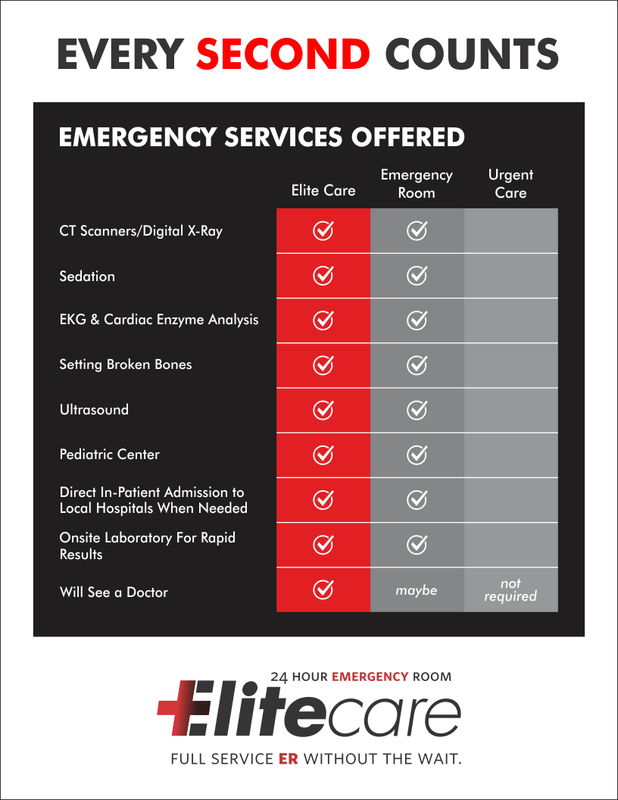 On average, patients are treated within 10 minutes of arrival at Elite Care 24-Hour Emergency Rooms. Learn more about pediatric emergencies here.